Town House Multi Unit Number Sign - - for three unit and four unit clusters of town homes, row houses, office park offices, villas and cottages on hotel grounds, etc. Some clients refer to this as our triple address sign or quadruple address sign. Made in USA. Personalized multi-line sign can be configured to mark almost anything including address numbers; apartment, office, room, or suite numbers; or short words or names. Ideal for builders and home owner associations to use as wayfinding signs throughout a subdivision, neighborhood, or condo community. Small 6.5" x 13.25" with three lines. Each line holds up to three (3) 3" numbers. TO ORDER THIS SIZE, SKIP LINE 4. LEAVE THE LINE 4 INPUT BOX EMPTY. Medium 6.5" x 17.25" with four lines. Each line holds up to three (3) 3" numbers. Large 8.3" x 17.5" with four lines. Each line holds up to four (4) 3" numbers. 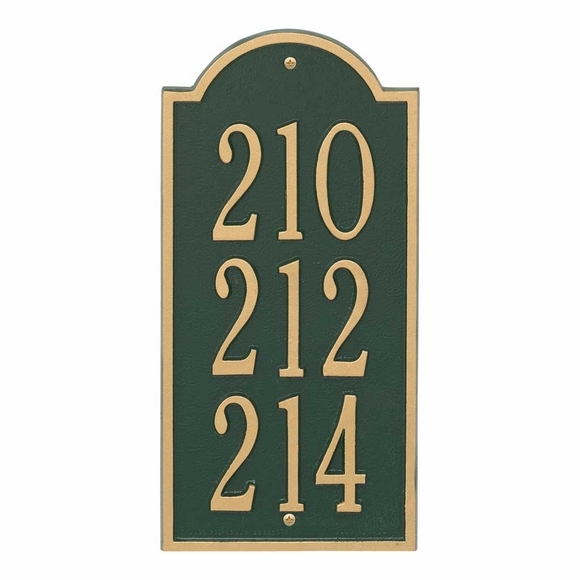 Multi Unit Address Number Sign for clusters of town homes, row houses, office park offices, villas and cottages on hotel grounds, etc. Made in USA. Also referred to as our multi address sign.